October was not an exactly good month for me. Apart from (1) coping with work issues and got over some misunderstandings, (2) emailing Velda about my missing online purchases from Bonito Chico (well, still not resolved but I decided to just let my $44+ fly away. I am definitely not ordering from them anymore), (3) final preparations for my wedding (other than the physical preparations, I think emotionally and mentally prepared are just as if not more important. I am getting the jitters and I am not sure if I can be a good wife, a good daughter-in-law, whether things will be okay. I stressed myself too much and I have high expectations of myself. ), (4) misplacement of my NRIC and hence unable to renew my passport. (I had needed to resolve this soon otherwise I can't travel for my honeymoon), the really draining one is (5) getting my claims from the salon (which I am going to blog in detail below). I signed up a package with the salon for bust enhancing/firming (whatever you call it). Out of 25 sessions, I only completed 10 and I didn't want to continue my package. Reason being, each time I have my treatment, it was not done professionally. I'm paying so much, I do expect a certain standard. The therapist will start selling throughout the treatment. If one therapist didn't succeed, another manager and / or consultant will come and talk me round. And whenever I decided not to, I was made to stay back in one of the rooms for at least one hour to listen to all their pressure selling. For some people, it's very easy to just leave and ignore them. For me, the atmosphere and people there were such that I was unable to do so. BEATS ME!!? Perhaps I'm too soft-hearted or simply plain stupid. Perhaps, I am also not thick-faced enough, not bold, not rude, not fierce, not firm enough and so on. It was until a point where I couldn't take it anymore, I didn't bring a single credit card with me and had just $5 in my purse whenever I go for treatments. Still, they pursued and continued hard-selling and aimed at my NETS card. On one occasion, I picked up the courage and told them I wouldn't want to carry on the treatments and asked if I can have a refund or whether I can exchange any products. I also politely asked to see their manager so that I can discuss and negotiate with her. The supervisor said that I am not allowed to see the manager, if there is anything I want to check and clarify, I can settle it with her. Her answer was a firm no, the company's policy is that they will not do any refund at all. From then on, I dare not turn up for any treatments for a few months. One day, they called me (supposedly to ask why I didn't turn up). Hubby had spoke to her, explaining the situation, but she was yelling and screaming over the phone at us for 15 minutes claiming that I am a very difficult customer. The conversation didn't end well. I felt that I was not heard and understood. To cut the story short, I decided to send them a letter of demand through my lawyers saying that I will consider bringing the matter to CASE. The salon took a long time to respond. Only more than 20 days later, they sent us a reply from Drew to deny my allegations. We did negotiate further from there, not directly but always through my lawyers. I decided that I must put everything down in writing. They claimed that "I unilaterally discontinued the treatments, thereby repudiating the terms of agreement." My lawyer adviced me that they are not ruling out for a counter-claim against me. In layman terms means, instead of me asking my money back, they are in a position of possibly suing me. Without a doubt, the receipts stated "non-refundable, non-transferable, non-exchangable". But I felt trampled and bullied and taken advantage of just because they have this clause. The salon delayed their replies through the lawyers (not sure whether intentionally) and that got me frustrated. Even when I was advised to leave things as it is, (just continue with the treatments) I didn't. I decided to go to Subordinate Courts, Small Claims Tribunal ("SCT") myself before the one year time limit is over (this time frame is very important, failing which, the SCT cannot hear your case). By doing so, there is a cap of how much I can claim back from them. Under SCT, claims can only amount to a maximum of $10K without consent. Still, I decided to do this. and get another date again. Then, the cycle repeats (3 times). I went down numerous times alone. I don't have any more annual leave and had to take unpaid leave. I even had to go to Court two days prior to my wedding day to submit the documents. It was a stressful period, at the same time tiring and I was filled with so much negativity (with my mom constantly scolding me for being dumb in this whole episode). I also had attended a hearing before a judge right after my honeymoon trip. 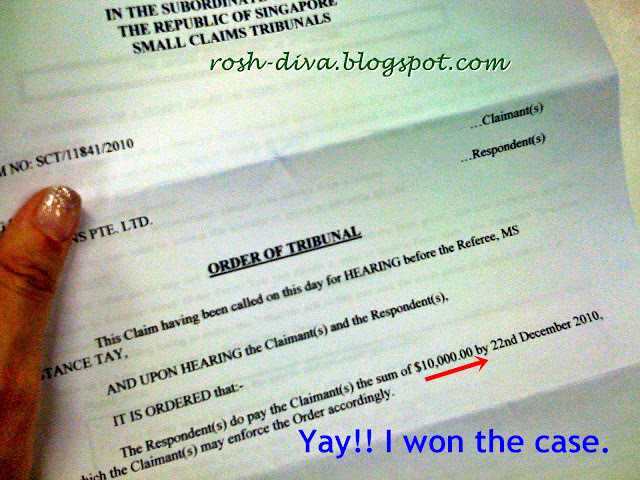 Thank God, the judge made the order in my favour and I got back my claim in full. Anyway, the order is binding and they have one month to pay me back if they don't intend to appeal. I have received my cheque and the money is in. The purpose of this entry is not to flame the salon. In fact, I am most angry with none other than myself for my stupidity/gullibility. I have learnt my painful lesson and would like to share with you some of the precautions and "traps" you should look out for before you sign very expensive treatment packages. (10) if the deal is too good to be true, check and re-check with others. Fyi, I did call CASE. But I was told that if there is only one or two complaints, it's unlikely they will do anything. They might do something about it if let's say 100 people lodged a complaint against the same company. So I didn't bother. In the last resort, go to SCT. Thank God for His protection and grace. The nights where I cried for strength, asked for comfort and seek for wisdom, He was with me all the time. I will tithed the claim amount to God as pledged. Really glad this is all over. If your product and services are good, people will naturally recommend friends. But if you are using unethical methods to sustain your business, sooner or later, your bad name will spread. I will only purchase from shops that has the CASE TRUST logo. I will move on. I will not say anything more about this unhappy incident. ps: I had earlier on received 5 emails from some of you in similar plight. I am now able to reply. Check your mailbox ladies. I'm happy to correspond from there. peppermin, please look at your multiply.com yo. Replied you. Thank you JuAnn and Dblchin. Nice !!! I seriously doubt I will be so persistant and go to the court. I am very scare of the court.. This is a good post for others too. good that you won!!! Justice done! I salute you babe! If it were me, I wouldn't go through all the trouble, stress, negativity and sacrifices just to bring them to justice. I would take the money lost as a lesson since the money isn't worth all the trouble. But I know it's not about the money at all; it's about what's right and in this case, you are right and things had to be put into order. I wouldn't have been able to go through the whole thing like you did and I could also imagine my hubby and mum saying i'm stupid too. you know what? I'm glad you did. You persevered and you won! I'm so proud of you. Merry Christmas! May the many blessings of love, peace and joy be with you always. Thank you everyone for your kind words. Hope that 2011 will be great for all of us. super-girl, it's very easy to guess. There are only TWO large bust treatment companies in Singapore. One is Slimfit, the other is Tokyo Bust Express. Both are aggressively active in advertisements. my dear girl, i was in the same plight as you. i wrote an 'unhappy' email but til date no response. mine wasnt very pricey. <500 sing . anyway that was my very 1st treatment. Hihi....I admire the way you stand up for your rights....thats the way! Can you kindly let me know which is the Salon u went to? hi can you ping me the salon name.. abt to sign one..
Hey darling, Can i know which salon is it? Unfortunately, I am unable to reveal the name of the salon here. Dun want to get into trouble mah. But if you send me an email, I might drop some hints. Thanks. I got pressurized into signing up a package of more than $2000 with Tokyo bust express in oct 2010. After two hours of hard selling, I relented. But after going home and reading how the treatments don't work and so much difference in prices, I went back to TBE and asked for full refund within 5 working days. They counteroffered 5 more treatments. I refused and then they offered only 60% back on cash. I went to CASE but after much correspondences, they were unable to do anything more. I'm thinking of going to small claims tribunal even though case says my chances very small. Could you advise me what were the things you said or did that convinced the judge to rule in your favor? Hi, I have package with them for more than $10k and would like to seek for refund as my body developed discomfort after their treatments. Can you let me know more on the flow and cost for SCT ? Since as mentioned CASE is not of any help for this issue. Let me know please, email me pangsherlin@gmail.com thanks! Hi, my friend is facing the same situation! Anybody kind enough to help? Please email me at Aarontoh92@gmail.com ! I'm so disappointed and upset. I just sign up 8k today at Tokyo bust and I'm reading super horrid reviews. Can u email me and share with me what u did to get your refund.